This is an insider’s guide to Singapore by locals. Fun fact: I lived in Singapore for a hot summer on a broke student’s budget. However, I have written this up to date guide with tips for Singapore together with Brooke and Alaine. Singapore is not considered to be a budget destination, however it is possible to visit Singapore on a budget. With insider tips for Singapore, you’ll find things to do in singapore on a budget, cheap food in Singapore, and where to stay in Singapore on a budget. The city-nation of Singapore is truly a traveler’s paradise: Everyone speaks flawless English, public transit is fantastic, the streets are clean of gum, there’s even Michelin starred food stalls, and there’s sunny weather year-round. Keep reading for more! Note: This post uses affiliate links. Please read my disclosure for more information. If you’re wondering what to do in Singapore on a budget, you’d be amazed how much there is to do. Plan for spending at least 2-3 days exploring this small city-country. All of these interesting places in Singapore are for those on a budget (ish) although some things are worth the splurge. As a broke student in Singapore, I can tell you that eating IS one of the best things to do in Singapore on a budget. Skip to the next section on where to eat in Singapore. Bukit Timah Nature Reserve.Tucked away in the middle of Singapore across a highway and a shopping mall, you can visit one of Singapore’s remaining virgin rainforests. This steep hike is particularly buggy (do NOT forget your mosquito spray …like I did), however you might get lucky and spot wild monkeys in the trees above. It feels a bit out of place compared to the rest of Singapore, but magical. Pulau Ubin. This island off the coast of Singapore feels like you’re going back in time. Singapore only grew into the modern metropolis that we think of it in the past 70 years, yet if you take a boat ride across the bay, you’ll quickly feel like you went back in time. Be sure to rent a bike and stop into some of the old style houses for a cold drink. You can’t miss the famous Merlion, which is Singapore’s mascot. You can visit the Merlion statue in City Centre with a view of the durian-esque Esplanade Theatre in the distance. There’s fantastic durian ice cream nearby! Chinatown. Singapore is a mix of cultures, but there’s a heavy Chinese influence. You’ll find traditional medicine shops here, lots of interesting architecture, and some tasty food. Little India and the Thieves’ Market. This neighborhood is the heart of the Indian population in Singapore with some fantastic Roti. It’s also home to a beautiful Hindu temple. The nearby Thieves’ Market is a flea-type market that started as a market for stolen goods, but it’s a normal flea market you can browse for fun surprises. As a flea market lover, I bought my batteries here. Haji Lane. This hip area used to be dominated by carpet manufacturers, however it’s become a cool hipster area to discover. You can step into the many small cafes and shops for a peak into Singapore’s younger cooler side. Save money on alcohol and spend a night smoking shisha at the many nearby shisha cafes. There’s also lots of adorable hipster shops and coffee shops! Tiong Bahru. Independent bookstores, boutiques, cafes, restaurants line the small streets as well as beautiful commissioned street art. 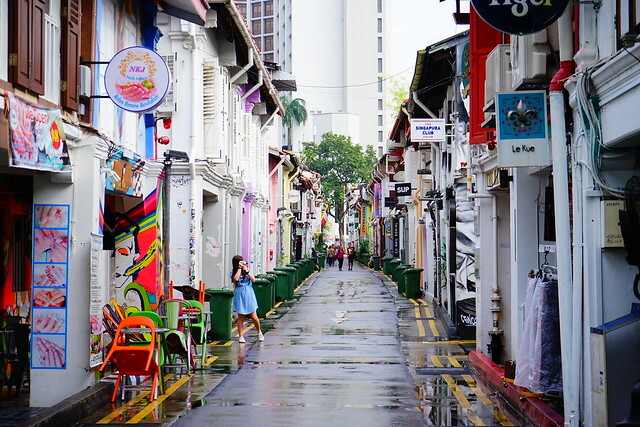 Click for a guide to Singapore’s coolest neighborhoods written by a resident! Outram Park is just a walk away from Chinatown and Tanjong Pagar. 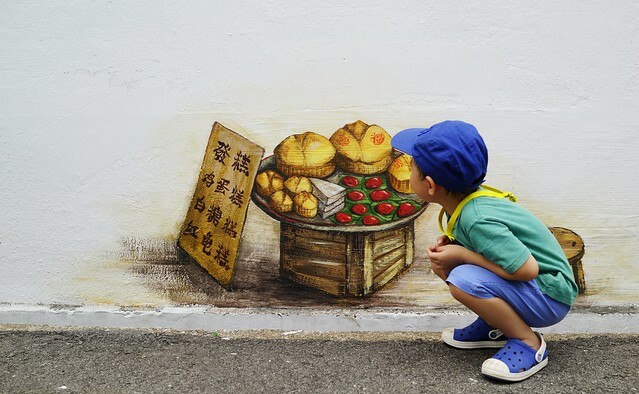 Look out for the conservation Peranakan houses with beautiful commissioned street art. Like Tiong Bahru, this neighborhood is now filled with little cafes and hipster eateries. Sentosa. For those seeking the sun, you can lay on Singapore’s artificial beach to soak in the sun! The beach is free although Sentosa tends to be a bit pricier otherwise. Bring your own lunch. Gardens by the Bay. The aerial walkway now costs money, but is definitely worth it. If you’re interested in epic views over Singapore, buy your ticket in advance to see the light show without waiting in line! The National Botanical Garden. This incredible orchid garden has some of the most beautiful orchids that I’ve ever seen.The Singapore National Botanical garden is a UNESCO Heritage garden and the fauna is native to the region. Personally, I think these gardens are much better than Gardens by the Bay because it is more of a natural setting. A walk by the Sir Stamford Raffles statue and newly renovated Victoria theatre. Peranakan museum. The Peranakans are the descendants of the Chinese immigrants who came to Malaysia & Indonesia in the 1600s-1700s. Their legacy is important for understanding Singaporean history. Bugis Market. Besides the money that you’ll spend shopping in this budget Singaporean maze of stalls, you’ll find some fantastic deals on accessories for your outfit and phone. I just enjoyed walking around here! Enjoy Changi Airport. It’s a bit strange to say, but Changi Airport is routinely rated as the #1 airports in the world. Between the duty-free shopping (important for drinking on a budget, enjoying the butterfly garden, or going to the movies, you can do more than you realize just in the airport. 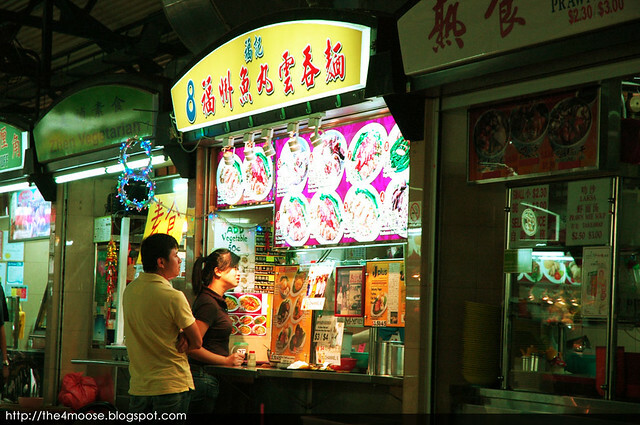 Visiting a Hawker Centre is a MUST for those in Singapore on a budget. Some of the best food in Singapore is found in open-air market halls called food centres (better known as hawker centres) and food courts (the air-conditioned version in malls). Most of these food stalls specialize in a limited number of dishes, but if you go to a food court, you and your friends can feast on incredible food from all the different stalls. Just be warned that you need to clean up after yourself. A hawker centre is a collection of little food stalls that specialize in a fixed number of dishes; these came about when the government decided to ban street carts and provide more hygienic locations to prepare and consume street dishes. These chefs have typically cooked it for years and they’re experts on how to make it – to the extent that two such stalls have been awarded a Michelin star each! You’ll need cash to pay for most stalls and you can bring your tray to a nearby table. Drinks are typically bought separately at a different booth. The food at hawker centres can start from as low as S$3 for a bowl of noodles. If you’d like a little more comfort, the food courts in shopping malls cost a little more (from S$5.50 a dish) but are air-conditioned, I recommend the FoodRepublic chain which can be found at Capitol Piazza (City Hall station), Suntec City mall (City Hall station), and Wisma Atria mall (Orchard Road station). Don’t ever ask two Singaporeans which is the single BEST hawker centre in Singapore,. You will never get one answer as there’s so many great food stalls serving up fresh and delicious variants of the same dish. On the other hand, some hawker centres are home to a few good stalls; go prepared with an empty stomach! Consider this a checklist for the famous food in Singapore that you’ll want to keep an eye out for while you’re here. If you’re really set on the best food in Singapore, look up the best stalls/food centres for each dish. Char Kway Teow. This dish is delicious and filling. It’s savory due to the large amounts of soy sauce, however it’s a spicy and cheap treat. Hokkien Mee. Stir fried noodles with prawns. Simple, cheap, and delicious. 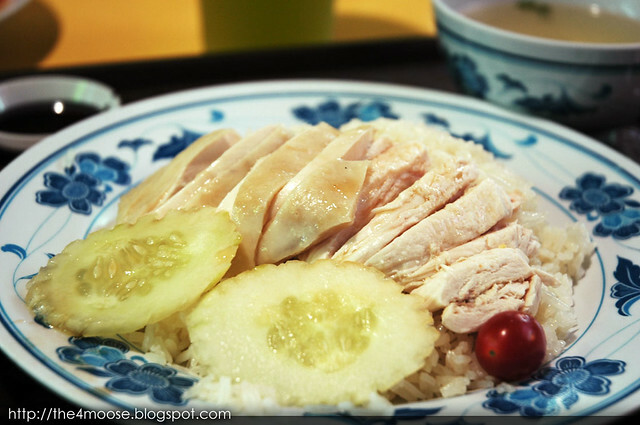 Hainanese chicken rice – Although this chicken seems simple, it’s amazing how much work goes into it. Look out for lemon chicken rice! 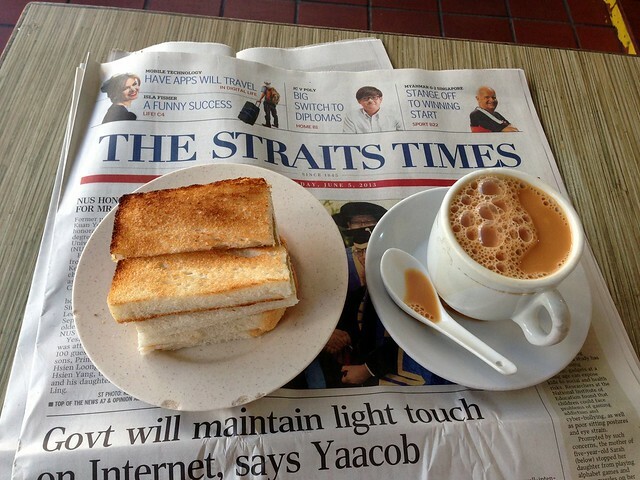 Kaya Toast is a favorite of mine. You can even buy kaya spread at the supermarket! It’s a nice cheap (and slightly unhealthy) breakfast for those on a budget as it often comes with a coffee. Singaporean coffee, Kopi, is a bit sweeter than European coffee as it’s made with condensed milk. Laksa. This famous and spicy fish soup has all different recipes around the city. 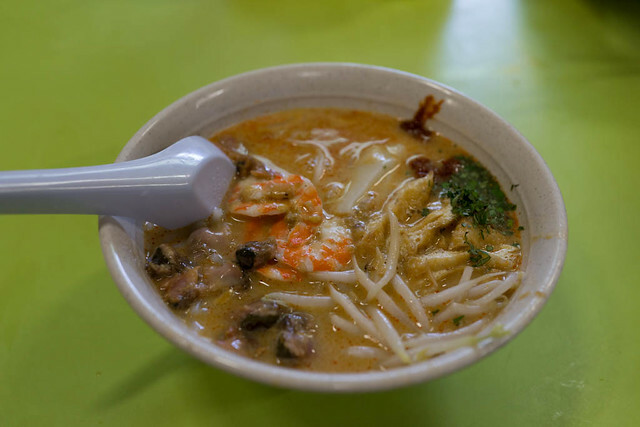 If you’re not a foodie, I recommend trying ONE Laksa in Singapore. You will be converted to the foodie side. Murtabak. This stuff pancake type dish is a nice treat. Nasi Lemak. This popular Malay dish is cooked with pandan leaf. It’s a sturdy and slightly heavy meal due to the large amounts of food that come with it. Popiah. A fresh spring roll type dish. Rojak. A fruit and vegetable salad with savory brown sauce. It’s savory and refreshing. One of my favorite lunch snacks. Sambal Stingray. This spicy specialty is made with stingray. If you’re an adventurous eater, you’ll want to track this dish down! Satay. These delicious barbecued meat skewers, usually available in chicken and mutton, sometimes beef. There are MANY other Singaporean foods that are famous, however some of them (including chili crab) aren’t cheap. Hawker/street food aside, you can sometimes find dining deals for those times when you want to indulge a little. The TCC chain, which does mid-range pasta and western-style dishes, sometimes has 1-for-1 offers. A few apps also provide dining deals and discounts.For more tips on where to eat in Singapore, click for more tips by Brook on where to eat in Singapore by a local. Bubble Tea. This refreshing and affordable imported from Taiwan is ubiquitous in Singapore. I love peach black tea with exploding bubbles! Durian Ice Cream. I can’t recommend raw durian, but durian ice cream is a treat in itself! It’s something definitely different, so if you’re looking for a uniquely Singaporean food, try durian ice cream! Fresh fruit/fruit juice. It’s great to buy fresh fruit pieces for as low as S$1! Ice Kacang. This refreshing and impressive dessert is the perfect treat on a hot day. Compared to other Asian countries, accommodation in Singapore is pricey for hostels with rates averaging about $20 USD for a bed at a hostel. You’re going to pay on average $80-120 USD for a decent and cheap hotel in Singapore, however if you’re traveling with a few people, it will end up being cheaper than a hostel. One of the cheaper neighborhoods to stay in is Chinatown, which is a short hop to the city centre for bars/places to go out! For those hoping to save money after the public transit has shut down (midnight to 5:30am), Chinatown is a short taxi away from Clark Quay and the main bars. It also has a lot of lovely historic architecture! Bugis is also a good central area in Singapore to stay in if you’re looking for somewhere walkable! Check hotel and hostel prices now! It’s good to remember that Singapore is small and it has great public transit, so you don’t need to stay in the centre to have easy access to the city centre/sights. Public transit shuts down at midnight…which leaves you at the mercy of taxis/ride shares (more about this in the transit section). Drinking is a surefire way to kill your budget in Singapore. The occasional Tiger beer can cost SG$6+, so you can imagine a night out will cost you dearly. Luckily, Singaporeans know how to party as they know how expensive it is to go out in Singapore. If you want to party a lot with drinking a lot, you will break your budget. Do as the Singaporeans do: use your duty-free allowance effectively. There’s a reason why there’s not many house parties in Singapore: a single bottle of vodka can cost up to S$50 Singaporean dollars. Shop the duty-free section at Changi International Airport and save yourself some serious cash by enjoying some homemade drinks prior to going out. If you’re going to go out, be sure to check social media and events 1-2 days ahead. There’s often sales of tickets ahead that will include 1-4 drinks included with the price of admission to clubs/bars. This will typically save you a lot of money if you’re set on experiencing Singapore’s nightlife. Be sure to budget for a taxi on the way home (or staying out all night) as public transit is closed between midnight to 5:30am. A lot of clubs will have a “ladies’ night” special on Wednesdays. (Why Wednesdays? Who knows). Typically ladies will get in for a ridiculously low price in addition to receiving FREE drink tickets. This is the BEST way to save money if you’re female and want to party in Singapore. Younger Singaporeans quite enjoy going out (18+) although clubbing is less about drinking, but dancing with friends. Expect to find groups of friends (typically of the same gender) dancing in a circle. You still see couples, however the friend circle (as I call it) is still a fairly common sight until later on in the night. Check the DJ & for deals on the Facebook/Instagram before you go! Ce la vie (on top of MBS) – if you go early on ladies night before 11 pm, entrance is free. The views are gorgeous from up at the top of MBS. Clarke Quay is catered to a younger crowd, so not surprisingly, this is where my friends and I would go out during my study abroad. You can find a multitude of different clubs and bars catering to different clientele although Zouk was always my favorite for its talented DJs that aren’t afraid to mix things up a bit. For more standard music (trance/R&B), head to Attica to dance the night away. Boat Quay – it’s more relaxing here by the water with several pubs and restaurants open late. Check out Penny Black pub, a regular British pub that hosts sports viewing parties and trivia nights. 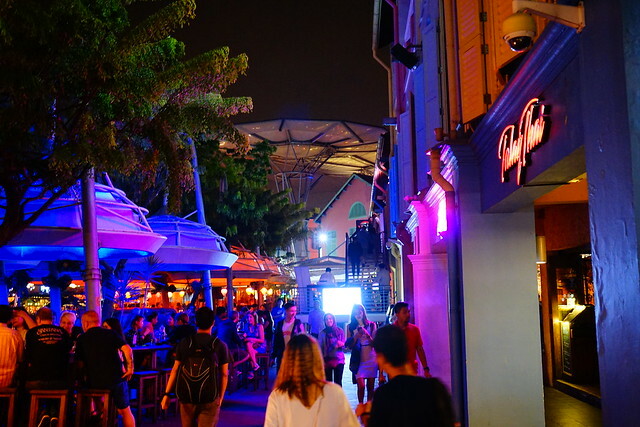 Robertson Quay – on the other side of Clarke Quay is a quieter enclave of bars and restaurants geared for an older crowd 26-55 and family friendly. Check out Wine Connection at Robertson Walk, the wine list and food menu are at a reasonable price and they have lots of deals. They also have a retail store that sells wine at pretty decent prices (for Singapore). Best Bars in Singapore…. For a splurge. The mixology and cocktails scene is trending in Singapore at the moment despite the rising alcohol prices due to the exorbitant taxes levied on wine, beer, and spirits. Speakeasy bars are really popular. You can also find world ranked bars in Singapore serving potent and delicious cocktails. If you’re a cocktail lover, budget quite a bit extra for world class bars like Manhattan Bar, 28 Hong Kong Street, Jigger and Pony, and the Cufflink club. Click for Alaine’s not so budget guide to the best bars to Singapore. Singapore has amazingly clean and GOOD public transit, however getting around Singapore is easy even if you prefer biking or taking taxis. Buses are cheaper than taking the MRT however if you have a longer distance, taking the MRT would probably be faster. Purchase an EZ-Link card at the ticket kiosk and then you can just add money to the card when you run low. On your last day, you can get the remaining money on the card back when you return your EZ-Link card at the ticket kiosk. Public transit does not operate between midnight and 5:30am, so you’ll need to take a taxi or rideshare home if you’re out late…or to stay out. Taxis: A ride downtown from the airport costs around S$30 thanks to various surcharges, and meters start from $3.40. Luckily, Singapore has both Uber and Grab (its Southeast Asian competitor), and both have pooled as well as private ride options at flat rates. Bike sharing: Singapore’s new bike-sharing services are by Chinese companies and of the dockless variety. Simply download the app(s) and you’ll be able to search for bicycles parked around you! oBike is the most popular and has the most bikes. You’ll need to put up a deposit of S$49; rides below 15 minutes are free and S$0.50 per 15 minutes thereafter. When you’ve arrived at your destination, just lock and leave the bike where it doesn’t cause obstruction. Download Obike and Mobike when you get here. You can get from Changi Airport to city centre by taking the convenient train, which runs between 5am and 11pm. Catch on the train from Terminal 2 and 3 and transfer to the westbound station at Tanah Merah. The bus is less frequent, however you can catch a direct ride from the Changi airport to the city centre using the Bus 36/36A. It is only S$2.50 although it takes about an hour. Expect to pay S$30 to S$40 for a taxi, Grab, or Uber from the airport. For the best prices on things, you’ll need CASH. Many smaller businesses (even ones with really good food) are cash only. You can go to a ATM for the best exchange rate. Don’t bring a durian on the subway. Although Singapore is infamous in Asia for its many laws (admittedly some a bit ridiculous: no gum chewing), most are not enforced. However, believe me that if you try to carry around a stinky durian, you will be fined and everyone will hate you. Don’t spit on the street and don’t litter. Both are illegal. Singapore is safe although crime still happens here and there. Use common sense. Singapore is not a conservative country, so you can dress how you want. However, for those not used to the heat and humidity (often above 75%), Singapore can be a brutal place to walk around in due to the heat. Almost everywhere is heavily air conditioned, so be sure to carry a sweater or something to layer up with. I was a bit shocked when I moved to Singapore as I’d see Singaporeans dressed like it was fall (in jeans and sweaters) during summer while I was sweating through my shirts/shorts. If you’ll be traveling around SE Asia for a while, you might get used to the humidity, but for those quickly stopping over, know that it will be HOT. Do not do drugs and/or bring drugs to Singapore. Singapore has very strict anti-drug laws and they enforce them. There’s been some high profile jailings/lashings of foreign citizens who tried to smuggle drugs into the Singapore. Prostitution is semi-legal in Singapore, so don’t be shocked if you hear discussion of a certain infamous shopping centre. If you do something a bit out of the ordinary in Singapore like make out on the subway, people may take videos of you and post it on STOMP!, the local online tabloid and public shaming website. Light public affection is okay (think holding hands), but anyone else is out of the norm in a public place. Save your PDA for a private space although it’s usually borderline at a club/bar. For more insider tips on the coolest neighborhoods in Singapore, see a guest post by another Singaporean resident on off the beaten path Singapore and the coolest neighborhoods in Singapore! Alaine is a complicated Adult Third Culture Kid with a lot of stories about growing up and working in different countries. A choreographer/dancer, travel blogger, wine geek, foodie, and event director. She writes on Travel with Alaine. Brooke is a pen-wielding sojourner from Singapore who blithely scrawls her way through cities and outlands, immersing herself in local culture along the way. On her blog Roamscapes, she shares guides and stories to help make travel more enriching. Have you been to Singapore? Anything you loved or that I missed? If you enjoyed this post, please share it! Great guide to an awesome country. Even though our hotel was pricey, we were surprised by how inexpensive so many other things were in the city. Absolutely loved the Botanic & Orchid Gardens. And the food! This is such a wonderful guide. We are planning a trip to this country on October. So needless to say, I am saving this post of yours. Loved your hint about choosing an accommodation in China town. I’ve been longing to visit Singapore. My husband has been there long before we got married and so it isn’t at the top of his list. 🙁 Hopefully someday we will be on a transit flight through and I will get a chance to see what everyone talks about! Wow! Took me a while to read that. Your post is so detailed. But that’s what I love, the detailed post. My favorites were the Infinity pool, the Bukit Timah Nature Reserve, the Durian Ice cream and the Merlion. I’m planning on visiting in November, so this is really good information. I love Singapore! This is the perfect guide on everything to do there. I thought all the food was incredible, and I went to a bunch of different hawker centres. The satay skewers were my favourite! I would love to get back to Singapore at some point, maybe even to spend a few months living in! This is such an awesome guide to Singapore! You’ve covered everything and this is really helpful. I wish I had this for my visit as Singapore is a little on the pricey side. The Hawker Centres are the best aren’t they! So many delicious and fresh things to choose from. Thanks for sharing! I’m in Singapore in October and really appreciate the tips on how to stick to a budget! I couldn’t believe the difference in accommodation costs compared to the rest of South East Asia. Thanks for the feedback. I’m updating the post accordingly! Wow Karen this is not a guide but a Thesis 😉 I loved how you have taken care to cover the detailed layout of your post. Thanks a ton! !